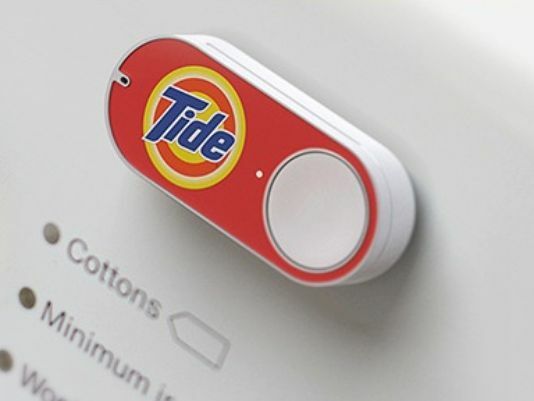 Amazon announced a new thingamajig called Dash Button last week. The idea is you put the whats-it, which is branded for some recurring purchase item, near that item and every time you need a new one, you just click the button. One of the examples was Tide. Put the dingus in the laundry room and, when you run low on Tide, click the button and two days later, you’ll have a new box on your doorstep courtesy of Amazon. This is brilliant. It is the combination of cheap technology, ubiquitous wifi and Amazon at its best, making it brain-dead-easy to buy more of whatever you need. In some ways this is Amazon at its finest, mixing technological innovation with shopping, two of America’s favorite pastimes. I might even consider this the ultimate in direct advertising: a constant reminder to buy Tide with no intermediary between pressing the button and getting your fix. Pavlov, anyone? But it seems so 2005 to me. Is buying a new box of Tide really so painful today that I need a doohickey in my laundry room? And how many of these thingies am I going to have in my house? Ten on my refrigerator, one each for Lucerne milk and another for Dole mixed juice and another for my Philadelphia cream cheese and another for … it just goes on and on and on? I already have a ubiquitous, always connected device with me all the time for ordering stuff, though. It’s called a smartphone. Wouldn’t an app that lists my common household items with a simple Buy button be so much simpler? I get it. This is a first stop — and maybe the most tangible so far — involving the Internet of Things. But it seems like this is a weak stopgap to a much more interesting future. In a couple of years, after all, there will be a sensor at the bottom of that Tide box that can sense how much detergent is still in the box. When it hits its target amount the Tide container is smart enough to send a notification to my smart watch: “Tide low. Order more?” with a simple “Buy Now” button awaiting your command. Having another whatchamacallit is definitely not what I need. So many things can be like this in our lives. My car can notify me when I need an oil change, my coffee machine can notify me to order more coffee, and it is all possible with ubiqutious technology and cheap sensors. This future is fascinating, but I don’t think it is going to look like a big branded whatsit attached to my washing machine.